The rounded protuberance at the end of a bone which is most often part of a joint or an attachment with another bone is called condyle. A rounded protuberance on a bone that is located upon a condyle is an epicondyle. 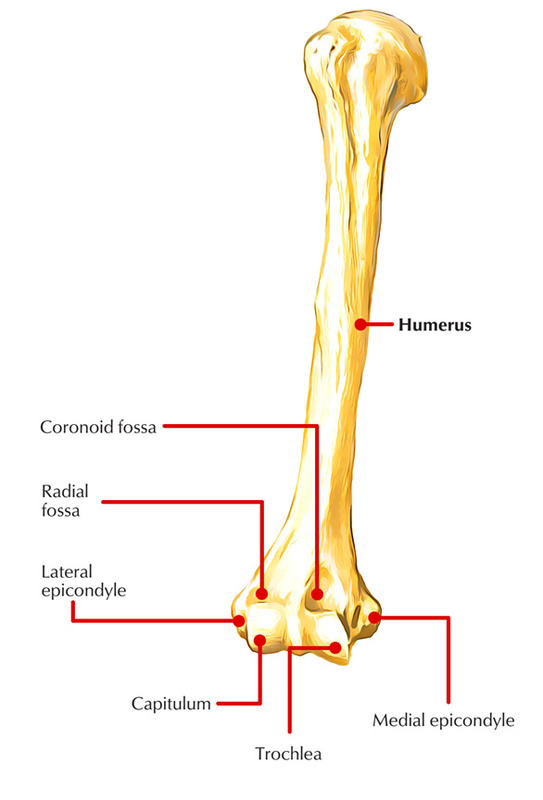 Its lower part consists of the lateral supracondylar rim and the lateral border of the humerus terminates at the lateral epicondyle. The lateral epicondyle does not protrudes outside the lateral supracondylar ridge, however, fills the lateral part of the non-articular section of the condyle. Compared to the medial epicondyle, which goes slightly backward, lateral epicondyle goes a little forward. For the superficial group of the extensor muscles of the forearm, its lateral as well as anterior surfaces show a well-marked indentation, which arise from the lower humeral epiphysis at the lateral side and they are extracapsular just like the flexors. 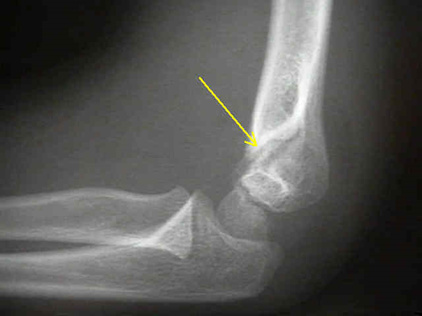 The posterior surface which is a little rounded is easily examined within an indent noticeable behind the extended elbow. The radial collateral ligament of the elbow joint attaches to it, and also a tendon common to the origin of the supinator and some of the extensor muscles. That includes anconeus muscle, the supinator, extensor carpi radialis brevis, extensor digitorum, extensor digiti minimi, along with extensor carpi ulnaris. Anconeus emerges from a small area on the posterior surface. Lateral epicondyle fractures are rare. They are much occasional compared to medial epicondyle fractures and signify tearing away of the lateral epicondyle. They are generally observed in the location of other injuries. Epidemiologically, occurrences are generally high in the paediatric age group 4-7 years. In children these injuries are assumed to happen because of rapid adhesive friction by the extensor musculature on the common extensor point of origin. Direct impact causes lateral epicondylar fractures in adults. Conservative treatment is given in non-displaced or minimally displaced injuries. In major displaced fractures, rigid internal fixation allowing early mobilisation is an option, although an option for these patients is conservative management. Most patients are asymptomatic, even in a non-union pseudoarthrosis; however surgical intervention can be carried out if symptoms do arise later. Operative involvement is necessary if the ossification is dislocated into the joint. Tennis elbow, or lateral epicondylitis, is a painful condition of the elbow that arises due to overuse of joint. This condition can be caused by playing tennis or other racquet sports. Also, several other sports as well as activities can likewise increase the risk. The tendons that join the forearm muscles on the outside of the elbow get swollen due to this condition. Repeating the same motions over and over again damages the forearm muscles and tendons from overuse. This causes pain as well as tenderness on the exterior of the elbow. Which muscle arises from the small part of posterior surface of lateral epicondyle? Which ligament of elbow joint attaches to it? What is another term for tennis elbow? Which bones lateral border terminates at lateral epicondyle? Who are more susceptible to lateral epicondyle fracture? For which muscle group does the lateral and anterior surfaces of lateral epicondyle shows indentations? Superficial group of the extensor muscles of the forearm. Which group of tendon in arms gets swollen due to Tennis elbow?